Hervé Morin, the Minister for Defence, is pleased about the order for 15 ARAVIS armoured vehicles placed as part of the defence section of the economy stimulation plan. That section of the economy stimulation plan amounts to 2.4 billion euros and will be used, among other things, towards a 10% increase in funds dedicated to equipment purchase in 2009. The Délégation Générale pour l’Armement (DGA – French Procurement Agency) advised NEXTER Systems of the contract on April 16, 2009. The purchase will provide the French Army with highly protected vehicles for reconnaissance assignments on potentially mined routes. The ARAVISs will go to the Engineers unit, which escorts BUFFALO and SOUVIM vehicles specialised in improvised explosive device prevention (IED) tasks in Afghanistan. 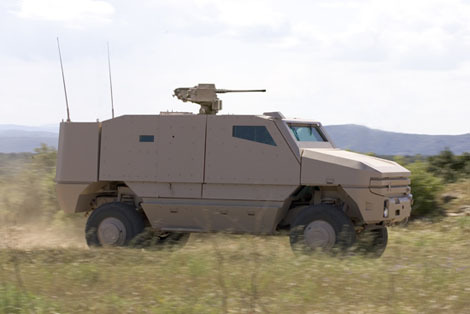 The ARAVIS is a 12.5-ton, air-transportable 4WD vehicle with a high level of combined protection against mines and improvised explosive devices (IED). It can carry as many as 7 Engineers unit personnel. Since it may have to counter-attack in unsafe area, it has a remote-controlled weapon station with a 12.7 mm machine gun similar to the VAB TOPs used in Afghanistan since the beginning of the year. For its reconnaissance tasks, the ARAVIS has, in addition to the turret cameras, peripheral cameras showing the nearby environment around the vehicle. The first vehicles will be delivered by NEXTER Systems to the DGA at the end of 2009. Users and personnel in charge of maintaining the ARAVISs will be trained upon the delivery of the first vehicles.